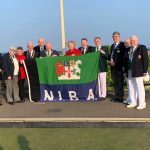 President Tommy Cheevers unfurled the Association Flag at Donaghadee Bowling Club on Friday evening to officially open the NIBA 2019 season. In bright sunshine and undeterred by a very stiff easterly breeze, the assembled dignitaries, guests and club members eagerly watched the progress of the Flag on its journey upwards. After a friendly, competitive, but brisk game of bowls involving the President’s Selection against the Donaghadee club, which incidentally ended in an honourable draw, everyone retired to the comfort of Donaghadee Golf Club, where a splendid meal and further hospitality was afforded to all. The NIBA and Guests wish to extend their appreciation to all the members of Donaghadee BC for their hospitality and as excellent hosts throughout. Best wishes to all for the season. Featured in picture L-R, Donaghadee Veterans President John Newell, Donaghadee Ladies President Lynette McKee, Donaghadee President Francis Porter, Cllr Mark Brooks, Deputy Mayor Eddie Thompson, Lady Sylvia Hermon MP, President Tommy Cheevers, IBA President David McCloy, NIPBA President Tom Lithco, NIPGBL President John Nicholl and BLI President Ciaran Ryan.